The Comet CHA250B broadband vertical antenna will amazingly cover 75/80 meters through 6 meters with no gaps! Transmit range is 3.5-57 MHz and receive range is 2-90 MHz. SWR <1.5:1. This 23.5 foot vertical requires no radials and weighs only 7.1 lbs. The antenna consists of five sections of aluminum tubing that slide into each other. The bottom section has the matching network built-in. Only two simple measurements are required during the easy assembly. It can handle 250 watts SSB and 125 watts CW/FM. SO-239 input. 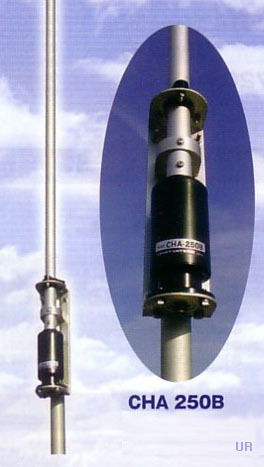 Mounts on a 1.2 to 2.8 inch mast (not supplied). Rated for 67 MPH (108 KPH) wind survival. The recommended mounting height is 8 to 10 feet from base of the antenna to ground. Best performance is realized when installed 33 feet above ground. Comet offers the optional CP45 mast and optional YS45 tripod for using the CHA250B in the field. Please see the June issue of CQ Amateur Radio for a review of this product (pages 22-24). Reminder ... as with all large antennas; please install this antenna in an open space at least twice the length of the antenna away from utility lines. Click here for more safety tips. This item cannot ship "flat rate". We can quote shipping to your location. Copyright 2005-2019, Universal Radio, Inc.